DASH is downtown Akron's free weekday shuttle service! 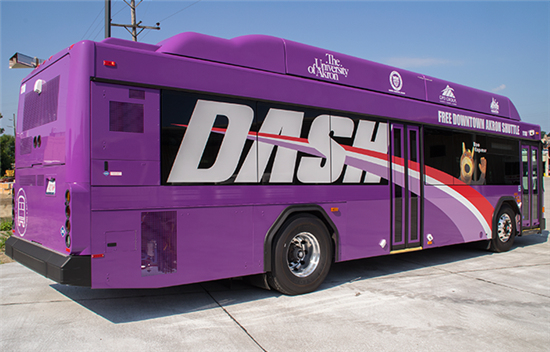 The DASH runs every 10 minutes from 7 a.m. to 7 p.m. and every 15 minutes from 7 p.m. to 11 p.m. It is a loop route that travels in a circle from our Transit Center, around downtown and to The University of Akron. Did we mention it's free? Let's DASH! Effective 12/10/18, a temporary inbound bus stop has been placed on Main Street in front of the Mayflower Manor building. At the times listed here, the free DASH bus will pick up and drop off at this stop on its way to the Transit Center. This temporary stop will remain in place until further notice during the Main Street construction period. DASH is brought to you by the City of Akron, Downtown Akron Partnership, GPD Group, The University of Akron, and us!